There’s an eatery in Perth’s CBD causing ripples on the internet. I traced the trail of rave reviews to two men, centuries-old tradition and a giant bamboo stick. Watch Erich tame dough in the window display. He sits slightly to the side. He’ll let you jump on the hard bamboo and you’ll understand why. After intense pummelling, a machine cuts the mixture. Laugh away, but this labour-intensive ritual results in smooth, springy, lush strands that pamper the mouth. A welcome contrast to factory-made versions full of egg powder, colouring and preservatives. At Noodle Forum, luxury comes at humble prices. All dishes are $11.90 except for some seasonal specials. The eggs and meats are free-range. The Mt Barker chicken is succulent. So is the Plantagenet pork, barbecued deep brown sans the usual lurid red dye. Wild caught Exmouth prawns give the wonton dumplings a juicy pop. Erich also makes the wonton skins in-house. It’s a MSG-free zone and a few customers find the soups too delicate but Erich and Ian won’t back down. Queues form everyday. These fans have tasted epiphany in a bowl – local, natural ingredients and tremendous passion. Erich with his bamboo pole from the 1970s. The pole has naturally darkened over time. Erich ran away from the noodle game at 21 and cooked in Germany and the US. One day in Hamburg in the 1980s he became galvanised watching an Italian chef making pasta from scratch. His father’s words echoed back. “Australia has the best wheat flour!” After repeated attempts he migrated to Perth in 2001 and kept cooking. He put his dream on hold and supported his wife and eight children. 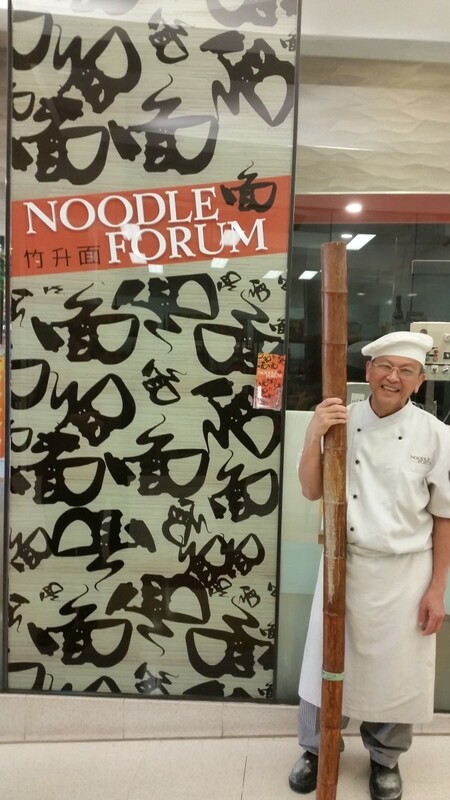 After meeting restaurateur Ian, Noodle Forum launched late 2013. Six days a week Erich starts around 5.00am. He yearns to pass on his legacy and Ian is his apprentice (none of Erich’s offspring are keen). Ian hobbled to his car with blisters in the beginning. They’ve broken one table and five poles. They source the bamboo from a bemused home renovation company in Sydney. Passion honours heritage while embracing new influences. Erich’s Caucasian son-in-law designed a metal anchor for the work table and the pole doesn’t thwack Erich in the face as it used to after snapping the old-style bamboo bracket. The team of Asian chefs have French cuisine training and are creating new recipes. Passion is infectious. It is a joy to share. The noodles, wonton skins, pickled chillies and sauces are available takeaway. The dough needs just 30 seconds of boiling. Noodle Forum supplies other Perth food enterprises including Papparich, Little Bird Café and This Little Pig Went to Market. The restaurant will be upgrading to bigger premises. The curious and inspired are now approaching them. “We get interest from other chefs, but they haven’t sat on the bamboo yet,” Ian laughs. Could you be the next Great Noodle Master? If you want to join Erich and Ian you’ll need grit, vision and preferably – buns of steel.